The American Royal began in a tent in the Kansas City Stockyards as a national Hereford Show. This show has grown into the annual American Royal Livestock show drawing owner/breeders, future business and agriculture leaders (high school and collegiate), and animal enthusiasts from across the country. The first American Royal horse show was added in 1905. The American Royal grew to include a rodeo in 1949 and was voted one of the top five rodeos in the country in 2004 and again in 2011 by the PRCA . The American Royal World Series of Barbecue® has continued to grow since the inaugural event was held in 1980. Spreading over 20 acres in Kansas City’s historic Stockyards District, and with over 500 teams competing in four meat categories, The Royal is the largest barbecue contest in the world. 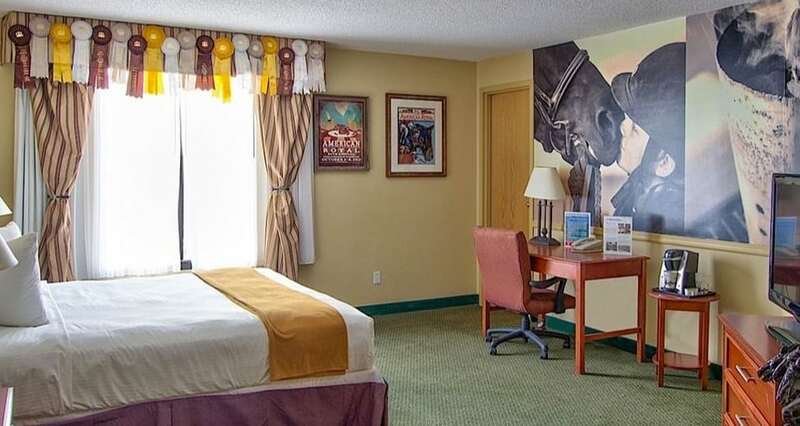 This room features curtains constructed of ribbons from the many cattle contests, an incredible montage mural (with a great photo of some “mutton bustin’) and possibly the only hotel room in the world with a Remington piece, ‘Coming Through the Rye’.